Popular production company Rooster Teeth posted a new video in their Immersion series. Looking at game myths, this newest episode sees what would happen if one of the best things about NBA Jam was real. 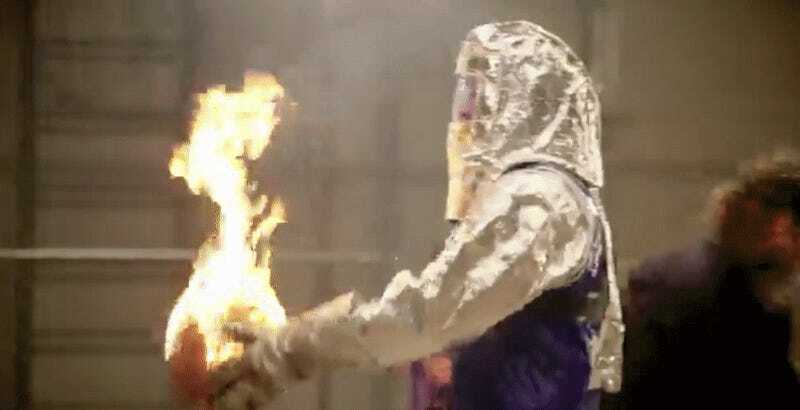 Rooster Teeth tossed Achievement Hunters Gavin Free and Michael Jones into flame retardant suits and covered some basketballs in rubber cement. After lighting the balls on fire, the pair took some free throws and tried some dribbling as well. You can watch the chaos for yourself. I remember playing NBA Jam with my friend up the block. It was a big deal to score enough baskets to end up on fire. Slam dunking the net and watching it light up in flames was good times. Preferably as Scottie Pippen and not Horace Grant, when possible. After seeing how scary it is to shoot a flaming death ball into a hoop for real, I’m probably just going to stick to the SNES version.